I have a weakness for my low-carb chicken tenders, so I tend to eat more than I really need to. I decided to cook some zucchini the same way so I don’t get as much protein (which raises insulin). Not bad! 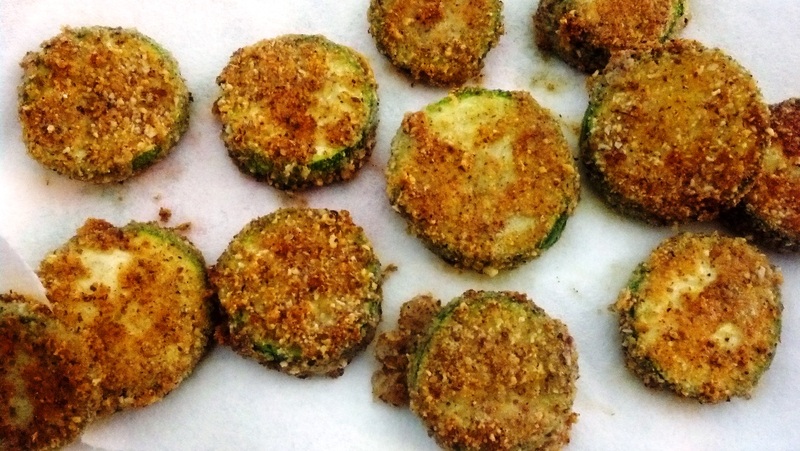 I haven’t made fried zucchini in a while, so I forgot to salt them and let them sit for a while before breading, but I was otherwise very pleased with the results. I’m sure I’ll be having this often. The breading is made from almond meal, parmesan cheese, a little ground flax, onion powder, garlic powder, pepper, and salt. I dipped the coins in a beaten egg first, swished them through the breading, then fried them in coconut oil. It’s my daughter’s turn to bring the snack for Girl Scout’s again. For this fruit cup, I used sugar-free strawberry Jell-O on the bottom, to which I added some blueberries, raspberries, and a single big strawberry. The next layer is sugar-free orange Jell-O with pieces of pear. I topped off the whole thing with some fresh, sugar-free whipped cream. The sprinkles are just regular cake sprinkles (I figured it’s not that much), but I’ve dyed erythritol before. 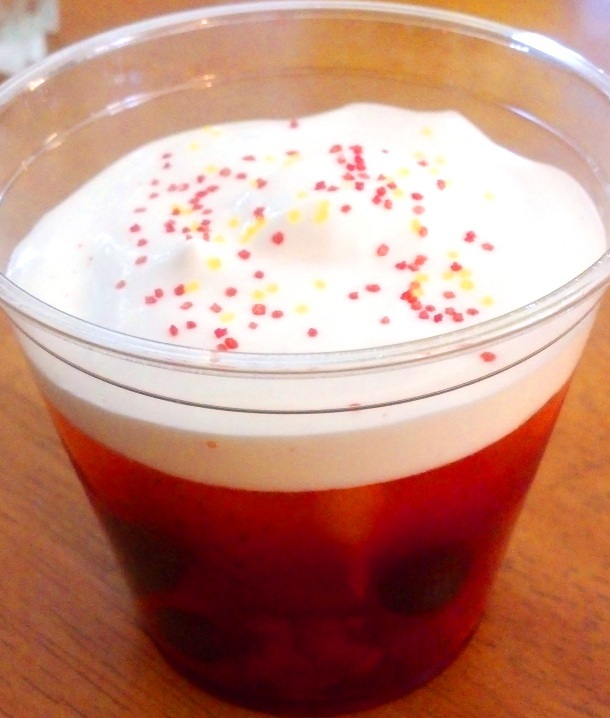 Today is a warm day, so I thought Jell-O and fruit would be refreshing, yet the colors mirror the beautiful autumn trees we’ve been enjoying. Yes, I like to make my desserts symbolic! I was kind of in a bind for dinner tonight. I had some thawed hamburger meat that I really needed to use, but I didn’t have any specific plans for it. So I sauteed a couple of chopped onions with a diced red bell pepper while I steamed a pound of frozen cauliflower in the microwave. When the veggies in the pan were just starting to brown, I added my pound (maybe a little more) of meat, added some powdered garlic, covered it, and let it cook while I drained and then pulsed the cauliflower in the food processor just a couple of times (going for a coarse chop to simulate pasta). I added this to the pan and let the whole thing simmer till the meat was done. Drained it, then added half a can of chicken stock. To the other half, I added about 3/4 teaspoon of xanthan gum, whizzed it up pretty good with my stick blender, then added it to the pan. Added about half a pound of cheddar cheese, some salt, and about 1/3 cup cream. 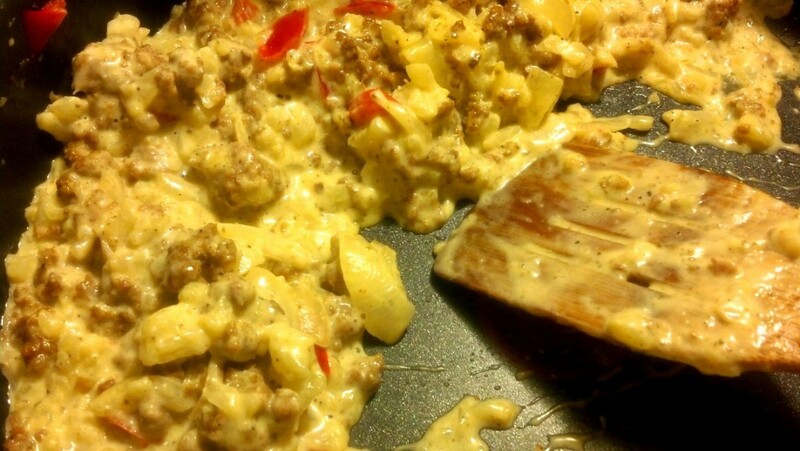 When my husband asked what was for dinner, I didn’t know what to call it, so I said, “Low-Carb Hamburger Helper.” He said he liked it. Daughter loved it. Veggie-hating son wouldn’t go near it, but I expected that. This entry was posted in Low-Carb Recipes, What I Ate Today. Bookmark the permalink.